Background/Aim: Obesity has become a global health care problem. In Saudi Arabia, up to 75% of adults are reportedly overweight. Morbid obesity has been associated with an increased risk of many comorbidities and mortality. Bariatric surgery is currently considered the most effective treatment option for morbid obesity. However, there are many concerns regarding the short and long-term complications of weight reduction surgery. It is unclear whether the general population is adequately aware of these risks. Therefore, we aimed to assess awareness of the general population of bariatric surgery complications. Although effective, bariatric surgery has been associated with many acute complications, reported in a range of 0.3% to 8% of operations. Patients and Methods: We performed a cross-sectional study between July and August of 2017 in Jeddah, Saudi Arabia. We used a 26-item, Arabic, electronically distributed questionnaire, to examine public awareness of the acute complications of bariatric surgery. Hypothesis testing was used to examine associations. Results: In total, 624 questionnaires were completed electronically. Mean age of participants was 25 (±13.2) and 66% were females. Of the surveyed population, 64% reported being aware of acute complications of bariatric surgery. 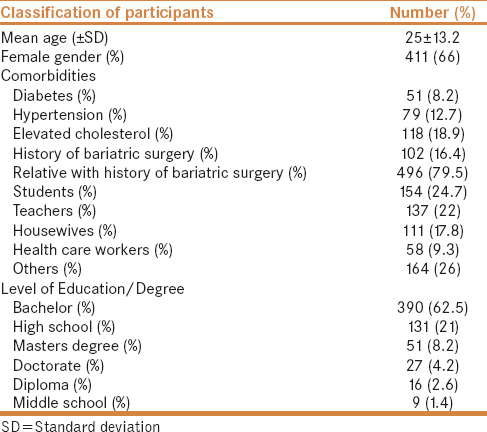 Participants who had previously undergone a bariatric operation had a higher degree of awareness when compared to those who had not undergone a bariatric operation before (80.4% vs. 61.3%, P < 0.001). Females had higher awareness compared to males (70.8% vs. 52.1%, P < 0.001). Awareness of complications was not statistically different when stratified by level of education (P = 0.131) but occupation predicted awareness (P = 0.007). Conclusion: Two-thirds of the general population appears to be aware of the potential acute complications associated with bariatric surgery. Furthermore, awareness seems to be higher in females, individuals who had previously undergone weight reduction surgery, and health care workers. Globally, obesity is increasingly becoming a health care problem. Obesity is now considered as an epidemic in many countries. According to epidemiological studies, 28%, 33%, and 25% of the adults in Australia, the USA, and UK are reportedly obese. In Saudi Arabia, there has been a very rapid increase in obesity rate according to a recently published report that estimated that approximately 75% of Saudi adults are overweight; this is thought to be the highest rate worldwide and has been attributed mainly to diet and sedentary life style. Excess weight increases the risk of many disorders that are associated with high morbidity and mortality, such as type 2 diabetes, high blood cholesterol, hypertension, and coronary heart disease (CHD). It has also been associated with osteoarthritis, gall bladder disease, sleep disorders, non-alcoholic fatty liver disease and certain malignancies.,,,,,, One of the greatest impacts of obesity is its overall economic cost. Obesity is the fifth leading cause of death in the world, and about one-tenth of the adult population in the world is considered obese. Bariatric surgery is a surgical procedure that reduces weight and is mainly indicated for morbidly obese patients (BMI more than 40) without comorbidity and BMI 35 with comorbidities., Bariatric surgery is considered the most effective method of weight reduction and is being performed at an increased rate. Approximately, 350,000 bariatric operations are performed yearly in the USA. Commonly performed bariatric procedures include laparoscopic sleeve surgery, Roux-en-Y gastric bypass, and laparoscopic adjustable gastric banding. Reports suggest that bariatric surgery has a great impact on the reduction of obesity-related conditions, such as hypertension and diabetes mellitus type 2. Although effective, bariatric surgery has been associated with many acute complications, such as bleeding, bowel perforation, gastric obstruction, infection, pneumonia, vomiting, dysphagia, reflux, heartburn, and dehydration; these complications have been reported in a range of 0.3% to 8% of operations. Surgical leak and pulmonary embolism appear to be the most serious complications as they may lead to death in some cases.,, Patients should ideally be counseled about these potential risks during the process of providing a written informed consent. However, given the growing popularity of these procedures and strong desire of patients to reduce weight, there is a concern that the risks of such complications might be overlooked. In addition, there are concerns that patients who do not fulfill criteria for morbid obesity undergo surgical weight reduction operations, probably to avoid going through long periods of dietary restrictions and strenuous exercise programs, or purely for cosmetic purposes. This might be tilting the balance of risk and benefit of these procedures toward the former. Thus, this study aims to examine awareness of the general population of acute complications of bariatric surgery. This electronic (internet-based) cross-sectional study was performed between July and August 2017. Data on demographics (age, gender, comorbidities, body mass index, education, and occupation), and knowledge of the potential short-term complications associated with weight reduction surgeries including bleeding, perforation, infection, obstruction, pneumonia, pulmonary embolism, leak, vomiting, dysphagia, heartburn, reflux, and dehydration, was collected using a 26-item Arabic questionnaire. The part of the questionnaire examining the main outcome of awareness was formed according to a literature review, which was conducted a priori, of existing recommendations for bariatric preoperative written informed consents, as endorsed by international bariatric surgery society guidelines. The primary outcome was level of awareness, which was reported as the percentage of “YES” answers to an inquiry about the participants' awareness of a side effect associated with the surgical procedure. Adequate awareness was defined as 50% response and optimum awareness as 75%. The main secondary outcome was to identify clinically relevant predictors of awareness. Baseline characteristics were expressed in tables; means and standard deviations (SD) were reported for continuous variables and percentages for categorical variables. We used student t test and Chi-square test to examine associations, where appropriate, with a significance threshold of 5%. Microsoft excel 2016 was utilized for data entry, and the final data was statically analyzed using STATA software; version 11.2 (StataCorp, Texas, USA). Ethical approval was obtained from the biomedical unit of King Abdulaziz University Hospital. An anonymous questionnaire was used to ensure the confidentiality of the obtained data and was preserved in a secure location. A total of 624 questionnaires were completed. Participants' age ranged from 18 to 69 years (mean = 39.3 ± 12.9) [Table 1]. Of the total participants, 92.5% were Saudis. In total, 340 participants were females (68.8%). Overall, 64.4% responded by “YES” to be aware of acute complications of bariatric surgery. Awareness was highest for dehydration (45.2%) and pulmonary embolism (13.1%) [Table 2]. There was a significant difference between the two genders; as more females responded positively to awareness (P = 0.001). The educational level (P = 0.93) was not significantly associated with the level of awareness [Table 3]. Participants who had previously undergone a bariatric operation had a higher degree of awareness when compared to those who had not undergone a bariatric operation (80.4% vs. 61.3%, P < 0.001). In addition, individuals with a relative who had undergone weight reduction surgery demonstrated better awareness (67.9% vs. 60.9%, P < 0.001). There was a significant difference between occupational groups with regard to level of awareness (P = 0.007). Health care providers had the highest degree of awareness followed by salesmen (77.8%), and housewives (75.7%) [Table 4]. Given the growing popularity of bariatric surgeries, it is crucial to assess community awareness for its potential complications. A dangerous perception would be that such surgical interventions are harmless. This is more relevant nowadays given the strong influence that social media platforms have on public opinion. To our knowledge, this is the first study of its kind to assess this concern. Given the high prevalence of obesity in Saudi Arabia, the Saudi community represents the perfect sample to survey. More than two-third of individuals that were surveyed (64%) reported awareness of the acute complications of bariatric surgery, which according to our pre-set criteria, is adequate. Awareness of long-term complications such as micronutrient deficiencies was not addressed in this survey. It is, however, noticeable that more individuals who had previously undergone a bariatric operation responded “YES” to awareness compared to those who did not undergo surgery (80.4% vs. 61.3%, P < 0.001); whether or not this awareness was acquired before surgery is unknown. It would be clinically relevant to assess awareness of these patients preoperatively, after a written informed consent is provided, to be able to evaluate whether whether or not surgeons stress enough on potential complications of these procedures. Our results also demonstrated that there is a significant difference in awareness between individuals according to their occupation. Not surprisingly, health care providers had the highest level of awareness. 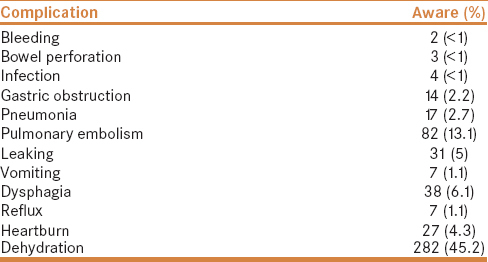 Surprisingly though, awareness was not differentiated according to the level of education. Our overall interpretation of these results is that more counseling is needed both on the societal and individual levels about the potential risks of bariatric surgery. This would lead to better balancing between potential risks vs. pursued benefits of undergoing surgery, and ultimately may lead to better selection of patients for these elective types of procedures. We recommend interpreting our results with caution as this study has many limitations including its cross-sectional design and that a non-validated method was used to collect data from an anonymous population. Duplication of responses cannot be ruled out in such a sample. Nevertheless, given the importance of the issues discussed from a public health perspective, these results should serve as a nidus for future studies. Our results indicate that the overall awareness of the general population of the potential complications of bariatric surgery is adequate but not optimal. Not surprisingly, awareness differed according to occupation and previous exposure to weight reduction surgery. This highlights the importance of intervening at different socioeconomic levels of the community, and obtaining detailed written informed consent preoperatively and educating the patients by different types of modalities, including bariatric surgery support groups. Emous M, Wolffenbuttel BH, Totte E, van Beek AP. The short- to mid-term symptom prevalence of dumping syndrome after primary gastric-bypass surgery and its impact on health-related quality of life. Surg Obes Relat Dis 2017;13:1489-500. Osland E, Yunus RM, Khan S, Alodat T, Memon B, Memon MA. Postoperative early major and minor complications in laparoscopic vertical sleeve gastrectomy (LVSG) versus laparoscopic Roux-en-Y gastric bypass (LRYGB) procedures: A meta-analysis and systematic review. Obes Surg 2016;26:2273-84. Nawawi A, Arab F, Linjawi H, Fallatah H, Alkhaibari R, Jamal W. An evaluation of knowledge regarding surgical treatment of obesity among final year medical students and recent graduate physicians from King Abdulaziz University. Med Ed Publish. 2017 Jan; 26;6. doi: 10.15694/mep. 2017.000012. National Heart Lung, and Blood Institute. Clinical Guidelines on the Identification, Evaluation, and Treatment of Overweight and Obesity in Adults: The Evidence Report. Bethesda, MD: National Institute of Health; 1998. Pi-Sunyer FX. The obesity epidemic: Pathophysiology and consequences of obesity. Obes Res 2002;10:97-104S. Mokdad AH, Ford ES, Bowman BA, Dietz WH, Vinicor F, Bales VS, et al. Prevalence of obesity, diabetes, and obesity-related health risk factors, 2001.JAMA 2003;289:76-9. Serdula MK, Khan LK, Dietz WH. Weight loss counseling revisited. JAMA 2003;289:1747-50. Must A, Spadano J, Coakley EH, Field AE, Colditz G, Dietz WH. The disease burden associated with overweight and obesity. JAMA 1999;282:1523-9. Calle EE. Rodriguez C, Walker-Thurmond K, Thun MJ. Overweight, obesity, and mortality from cancer in a prospectively studied cohort of U.S. adults. N Engl J Med 2003;348:1625-38. Lehnert T, Sonntag D, Konnopka A, Riedel-Heller S, König H. Economic costs of overweight and obesity. Best Pract Res Clin Endocrinol Metab 2013;27:105-15. Aldaqal SM, Samargandi OA, El-deek BS, Awan BA, Ashy AA, Kensarah AA. Prevalence and desire for body contouring surgery in post bariatric patients in Saudi Arabia. N Am J Med Sci 2012;4:94. Landecho MF, Valenti V, Moncada R, Fruhbeck G. Eligibility and success criteria for bariatric/metabolic surgery. Adv Exp Med Biol 2017;960:529-43. Padwal R, Klarenbach S, Wiebe N, Birch D, Karmali S, Manns B, et al. Bariatric surgery: A systematic review and network meta-analysis of randomized trials. Obes Rev 2011;12:602-21. Landais A. Neurological complications of bariatric surgery. Obes Surg 2014;24:1800-7. Charalampakis V, Tahrani AA, Helmy A, Gupta JK, Singhal R. Polycystic ovary syndrome and endometrial hyperplasia: An overview of the role of bariatric surgery in female fertility. Eur J Obstet Gynecol Reprod Biol 2016;207:220-6. Choban PS, Jackson B, Poplawski S, Bistolarides P. Bariatric surgery for morbid obesity: Why, who, when, how, where, and then what? Cleve Clin J Med 2002;69:897-903. Jammah AA. Endocrine and metabolic complications after bariatric surgery. Saudi J Gastroenterol 2015;21:269-77. ALNohair S. Obesity in gulf countries. Int J Health Sci 2014;8:79-83.